This is one of the cards I made for an SAB swap I was in - it features So Many Scallops. My sample is not here, so I will do my best with the details! 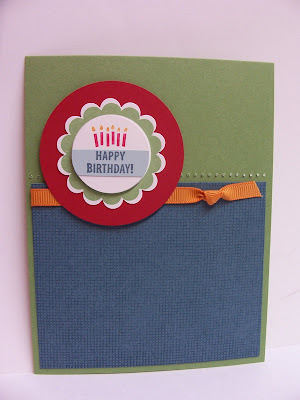 I stamped the happy birthday scallop on white scrap with wasabi ink and punched it out with the scallop punch. I colored the candles with real red and pumpkin pie markers, stamped it on white scrap, and punched it out with the 1-3/8" circle punch (I think! It might have been the 1-1/4" one, lol!) I then stamped the happy birthday scallop in blue bayou ink on soft sky scrap, punched it out using the same circle punch as the last step, and then cut out the words and attached them underneath the candles. That circle was popped up on dimensionals on the wasabi scallop. Of course, the one stamp I used was cleaned in between each step, lol! I attached the whole scallop to a real red circle. The bayou paper has Canvas background stamped on it with bayou ink, the pumpkin ribbon knot was attached, and the bayou square was attached to a wasabi base. I turned the wasabi base over and pierced a row of holes from the back for a different look. The red circle was attached on the card to finish it off. Super cute card! I love the color combo! Love this card! So clean and crisp! Love the canvas on the bayou. I forget about my background stamps sometimes. Canvas is great and gives a faux textured look to me. gonna pull that one out today! Color combo is so rich looking! can't wait to see it IRL! Ok, too funny! I guess this would have answered my question about when you post swap pics, if only I'd gotten over here yesterday to see this! Heehee! Very cute, Becky!